Customers in over 10 countries have selected InGenius Connector Enterprise for Open CTI as their Click-to-Dial and Screen-Pop solution for Salesforce. Today, InGenius Software announced that they have successfully installed over 50 customers with their InGenius Connector Enterprise for Open CTI solution. InGenius Connector Enterprise is server-based Computer Telephony Integration solution, designed to connect existing enterprise phone systems with the enterprise Salesforce instance – all with absolutely no desktop software required. InGenius Connector Enterprise provides users with an easy way to make, receive, and automatically log calls from within Salesforce while also providing business managers with accurately captured and instantly available call center report data. InGenius is demonstrating InGenius Connector Enterprise for Open CTI in Booth #W234 at Dreamforce. InGenius Connector Enterprise is a server based product that resides at the customer site to capture every call within Salesforce. For use in Sales Cloud, Service Cloud, and Salesforce Console, this revolutionary CTI product leverages Salesforce’s new Open CTI platform to provide users with outbound click-to-dial, in-bound screen-pop, automatic call logging, call wrap-up codes, agent log in and more. Since calls are automatically logged, call records are accurately captured and instantly available for detailed reporting, giving managers a real-time insight into call center operations. InGenius Connector Enterprise is a true enterprise call center solution. InGenius provides Salesforce customers running Cisco, Avaya, Mitel, or Asterisk PBX systems, or Broadsoft or Mitel hosted VoIP services, with a highly reliable, scalable, clientless CTI solution that runs in any browser and on any machine. InGenius Connector Enterprise is helping Salesforce users around the globe achieve positive impacts on their call center productivity. There have been a couple of interesting articles lately about the things startups can and should do to get and keep customers, and to build loyalty. In particular I thought that this article – (Dial up: Why startups should use the phone) was interesting, and highlights something we try to do at InGenius. We definitely use the phone here at InGenius – we call potential customers as quickly as possible when they contact us, and we walk every customer through installing and configuring the software (which takes about an hour in most cases), and help them get up and running. We’ve found that this personal touch really makes a difference and starts to build a bond of trust between our customers and ourselves. Another recent post by Paul Graham (Do things that don’t scale) and 37Signal’s Jason Fried’s excellent post highlight the same ideas – get out there and get in touch with your customers! We recently had an InGenius Connector Enterprise customer who wanted to have clickable phone numbers associated with each opportunity. By default, opportunities don’t have any phone number fields. The customer’s workflow was that they wanted their workers to go through the opportunities, and call each one every few days, until the sales was closed. We advised the customer to add a field to the opportunity of type “Phone.” We called this field “Account Phone.” Since this field is of type “Phone,” it will automatically be converted to a “click-to-dial” field by InGenius Connector Enterprise. We then added a trigger to the Account that detects any changes, and then loops through all the opportunities associated with this account, and updates the “Account Phone” field in all the opportunities. This way, the opportunities all have a clickable phone number field that stays in sync with the phone number field in the Account. List<Opportunity> oppList = [SELECT id, Account_Phone__c FROM Opportunity WHERE Accountid = :acct.id AND Account_Phone__c != :acct.Phone]; // Find all the opportunities for this account. oppList[i].Account_Phone__c = acct.Phone; // Update all opportunities with the new phone number. The solution uses some Apex code to accomplish its magic. You’ll need an appropriate Salesforce.com subscription to use this solution. The code loops through all the Opportunities each time an Account is changed. This could use up your Apex allowance. If the user edits the Account Phone field in the Opportunity, this is not copied back up to the Account. You could add a second trigger for this, if needed. If the user edits the Account Phone field, the changes will be wiped out the next time the Account is edited. Another alternative is to make the Account Phone field read-only in the Opportunity Layout. September 18, 2012 at Dreamforce, InGenius Software announced their new Enterprise CTI solution, InGenius Connector Enterprise for Salesforce. InGenius Connector Enterprise for Salesforce is the first click-to-dial software solution for Salesforce.com built using the new Salesforce.com Open CTI interface. With no desktop install, InGenius Connector Enterprise for Salesforce, streamlines call dialing and inbound/outbound logging activities for an entire organization. InGenius Connector Enterprise for Salesforce, will be available directly from InGenius Software at http://www.InGenius.com or by calling 613-591-9002 x3000. InGenius Connector for Salesforce is fully integrated with Salesforce.com to enable several features including incoming call screen pop, click-to-dial, and automatic call logging all from within the Salesforce.com user interface. Additionally, InGenius Connector Enterprise provides automatic field population and configurable templates for fast, accurate logging of all calls against Salesforce.com records. Since InGenius Connector Enterprise for Salesforce utilizes the new Salesforce Open CTI, it requires no desktop install and can be used on both PC (Windows) and Mac (OS X) and accessed from any browser (Chrome, Mozilla Firefox, Internet Explorer). InGenius Connector for Salesforce, is installed on premises at a customer site and connects directly with the customer’s resident telephony system. InGenius Connector Enterprise interoperates directly with the telephony system and does not require any additional hardware or software products to be purchased or installed. Initially being released for Cisco’s Call Manager, InGenius Connector Enterprise for Salesforce works with several telephony platforms including Cisco Unified Contact Center Enterprise (UCCE), Cisco Unified Contact Center Express (UCCX) and Avaya. Are you getting annoying pop up messages in Internet Explorer when you use Salesforce? Does Internet Explorer ask you if you want the best website builder? That’s a whole lot of extra clicking! If you would like to avoid this pop up, you can make a change in Internet Explorer’s Internet Options. For this change, we’ll be changing the Internet Explorer security settings to Enable the display of Mixed Content on the page. You may want to check in with your network administrator before you make this change. 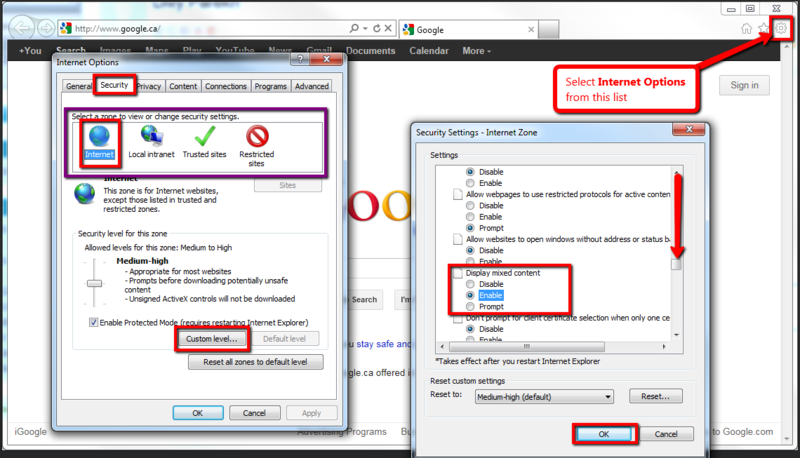 1) Open Internet Options in your Internet Explorer browser. You can do this from the icon in the top right (shown below). 2) Select the Security tab at the top of the window. 3) Select Internet (we’ll also have to do this for each of the four ‘zones’ displayed), click the Custom level.. button. 4) Scroll about halfway down the list until you see the Display mixed content setting. 5) Change to Enable. This should fix the problem – however, you can also continue on to edit the same settings for Local intranet, Trusted sites, and Restricted sites, if you want to really make sure it doesn’t happen anymore. 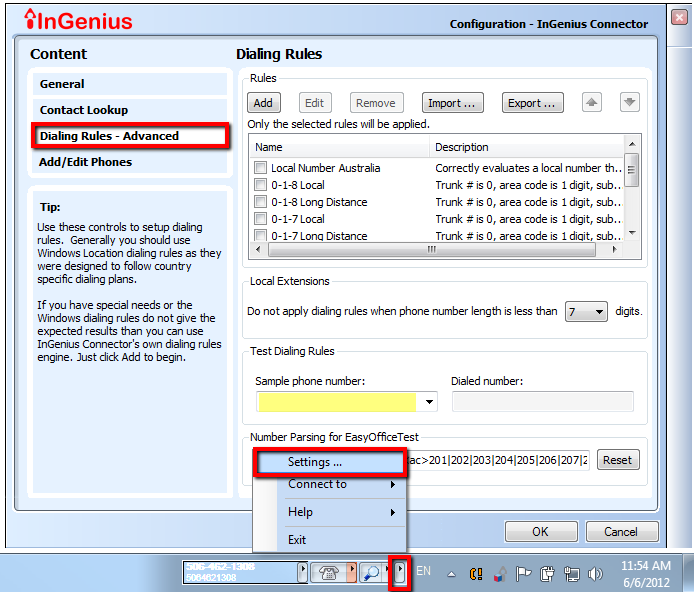 InGenius Connector can create and manage it’s own dialing rules, but it also relies on the Windows Telephony Location rules to tell it how to dial. You can set these rules up in “Phones and Modems” on your Windows Control Panel, or directly from a link in InGenius Connector’s configuration window. If you do not see the checkbox beside “Use Windows Telephony Location” where the arrow points in the image above, that means you are not an administrator on your computer and this option is already automatically checked off for you. Click on the “Edit” button encircled (ensquared?) in red above. Clicking the “Edit” button will take you to the “Phone and Modem” dialogue box on the left. If you do not see an area code and location that matches your current location, click “New” to set it up. If it’s there, or once you’ve created your location, click “Edit.” This will bring you to the window on the right of the image above. Double check your settings, and make sure that all of the right numbers are in the yellow highlighted box. For example, I have “9”s there to access a line outside of my office network. You probably also want to make sure that “Tone” dialing is selected. Finally, click the “Area Code Rules” tab at the top of this window. 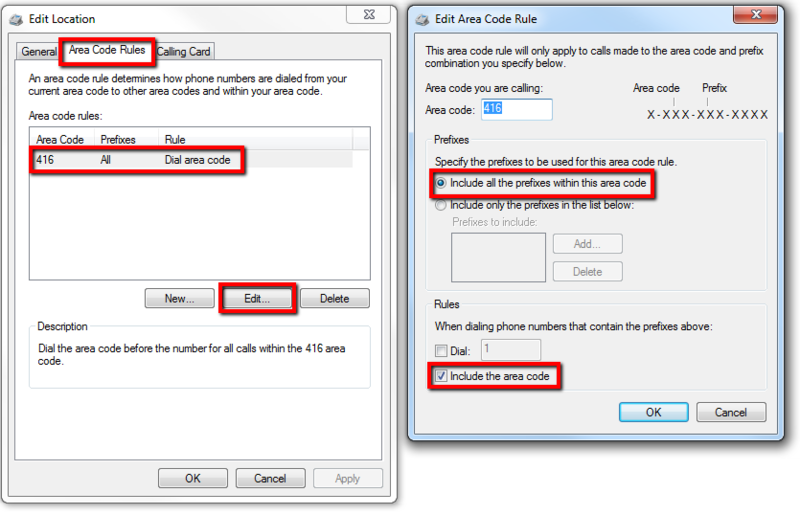 Clicking on the “Area Code Rules” tab at the top the of the “Edit Location” screen on the left of the image above will let you define rules for a specific area code. 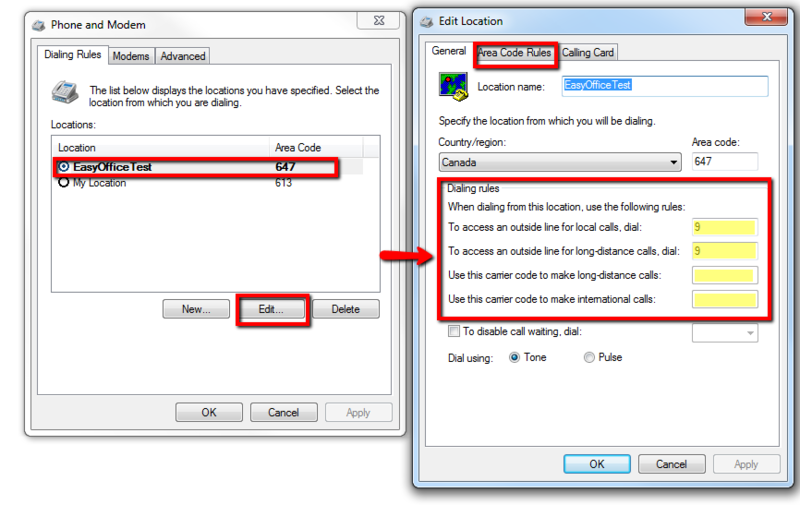 For example, if you want to make sure that your local area code is always dialed, you would select/create the area code from the window on the left, and then click “Edit.” This will open the Edit Area Code Rule window on the right of the image above. Make sure these settings are to your liking, and then click “OK” on all of the windows you’ve opened. 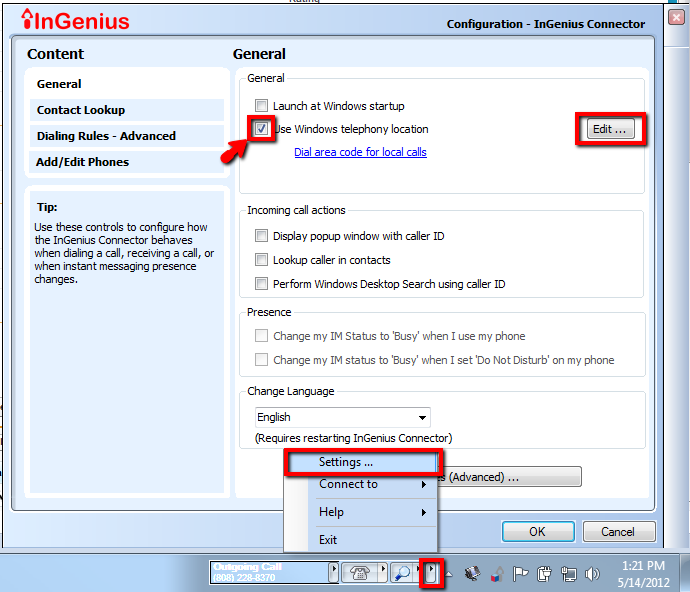 As a final test, you can open up the InGenius Connector settings window and navigate to the “Dialing Rules – Advanced” screen, as shown above. Type in the number you want to dial in the highlighted field above, and make sure the number that appears in the “Dialed number:” box is what you want to see. If you are located outside North America and need to use our country-specific dialing rules, this screen is also where you have the option to select different dialing rules, or to import new dialing rules. Finally, if your dialing rules queries are still unanswered, or if you want to know even more, you can read about Advanced Dialing Rules on our Knowledge Base: http://bugs.ingenius.com/default.asp?W19. Warning: Advanced dialing rules look scary. I mentioned in a previous post that we’d released a new version of InGenius Connector for Salesforce on Cisco platforms. In the meantime, we’ve also released InGenius Connector for Microsoft Dyanmics CRM on Cisco platforms, and now our newest version is available across all of our phone platforms and CRMs. We think you’ll love the new features. Take a look and test it out with a free trial!